One of the toughest things to do, if you're in a multi-session school like mine, is to figure out how to work in all the things that the Memorandum of Agreement asks for. For example, Chancellor Carmen Fariña loves her some PD, and you have to work that in somewhere. There's also the whole Other Professional Work thing, and Parental Contact. I'm a great believer in both. Parental contact helps me do my job, and really helps me run the sort of class I want to have. Other professional work is kind of a monster, as there's just never enough time to do what needs to be done. But then there's this other thing--the inquiry team thing that for some reason there's all kinds of pressure to have. It's also pretty hard to do effectively in a large school like mine because of scheduling. In fact, it's probably very hard to do in a small school too, because how many science teachers are there in that school and when can they meet together? Because of various things that happened last year, our SBO was very tough to negotiate. 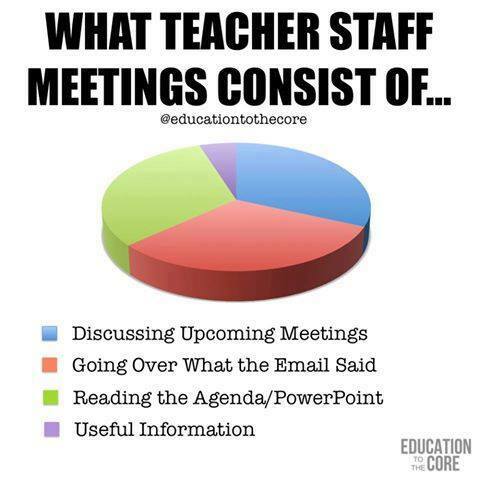 Our committee and the principal spent months batting things back and forth without an agreement. He demanded this, and I demanded the opposite. Then I demanded that, and he demanded the opposite. We went on this way for months, until finally, by some miracle, we came to an agreement. Of course, at almost the exact moment we did that, a better idea came along. Instead of eight periods, we break our day into nine. During the ninth period, all teachers will tutor one period, have PD another, and do Other Professional Work the other three. I had no idea the school was short of tutors, but now I know. I kind of like the idea, and see it as kind of an office hour. If a student wants to see me about whatever, I'm not gonna say go to hell, I'm here to tutor. Also people with comp-time jobs, like deans, now get a good amount of prep time during the school day. But there are always the unanticipated side effects. In the case of our school, the principal set aside a portion of the library for tutoring. I don't really like this idea, as I really value the library. The librarians are even less happy about it than I am. But in an overcrowded school with no extra space I'm thus far unable to suggest a viable alternative. Last year, after at UFT inspection and air testing, we closed a classroom full of diesel fumes. Instead we had classes in a gym with basketballs bouncing off the walls. We were lucky not to have people bouncing off the walls as well. Our SBO passed overwhelmingly, and I hope it works out. One good thing about an SBO is that if it does not work out, it goes straight to the scrapheap in June. Will our PD be worthwhile, or will it just be our supervisors screaming at us about our chronic inadequacies? Will anyone show up for tutoring? Will 200 kids per teacher show up at a time? Will having 42 minute classes instead of 45 minute classes fundamentally affect student lifestyles? It's tough to say. All in all, though, I think it's better than sitting around extra hours Mondays and Tuesdays. Do you do that? What's it like? Are you in an overcrowded school with an SBO? How is it working out for you?